Laughing Dog Complete Puppy is a hypoallergenic diet which has been specially formulated to supply puppies with all they need to grow up fit and healthy without the need for extra supplementation. 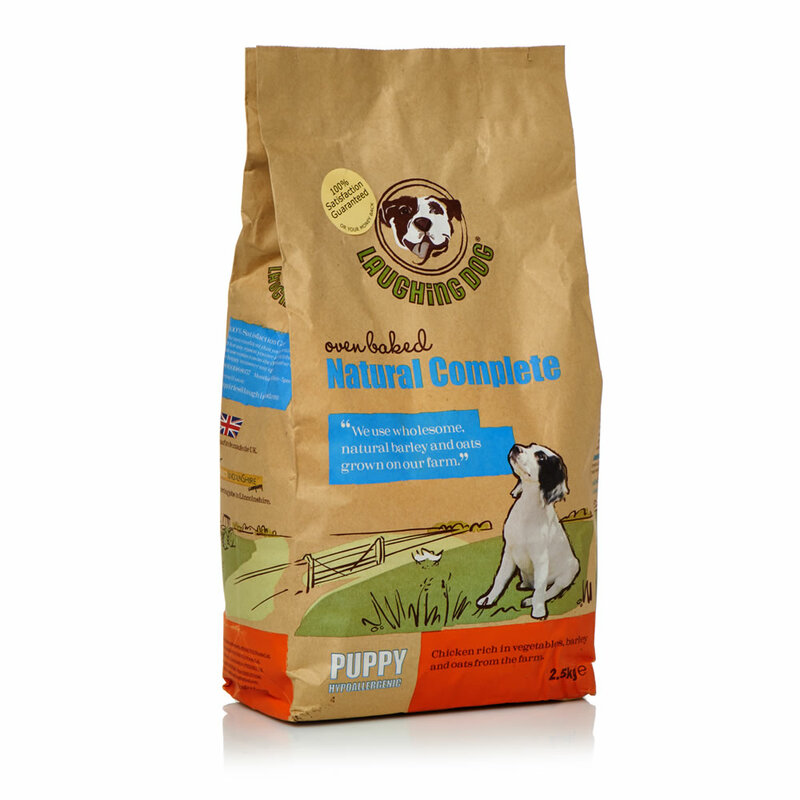 It contains oats, barley and other ingredients to support your puppy during his biggest growing stage. Chicken (34% Poultry meat meal, Fresh chicken), Barley meal (30%), Vegetables (14% Potato, Pea, Carrot), Oatmeal (7%), Poultry Oil (5%), Linseed (3%), Sugar beet flakes, Minerals*, Cellulose Fibre, Yeast, Glucosamine, Chondroitin sulphate. *Minerals include vitamins B complex, C and K, citrus extract, seaweed/kelp, tocopherols, yucca extract, L-Carnitine, rosemary extract. Vitamin A 21000iu, Vitamin D3 2000iu, Vitamin E 500mg, Zinc chelate of amino acids hydrate 200mg, Ferrous sulphate monohydrate 167 mg, Manganese sulphate monohydrate 156mg, Zinc sulphate monohydrate 97mg, Culpric sulphate pentahydrate 30mg, Sodium selenite 9mg, Calcium Iodate anhydrous 3.3mg. The following table shows the daily recommended feeding amounts for puppies from 6 weeks of age up until adulthood. It is important to moisten food when giving to puppies under 12 weeks of age. Always ensure your puppy has access to fresh water. When changing to Laughing Dog, gradually introduce the food over 7 days. There are currently no questions for Laughing Dog Complete Puppy Food - be the first to ask one!